It’s hard to beat the flavour of meat that has been grilled over hot coals, and balmy summer evenings in Melbourne means the barbeque is being put to good use. We have limited appetite for plain grilled sausages and lamb chops so each summer I have to dig deep to create variety. 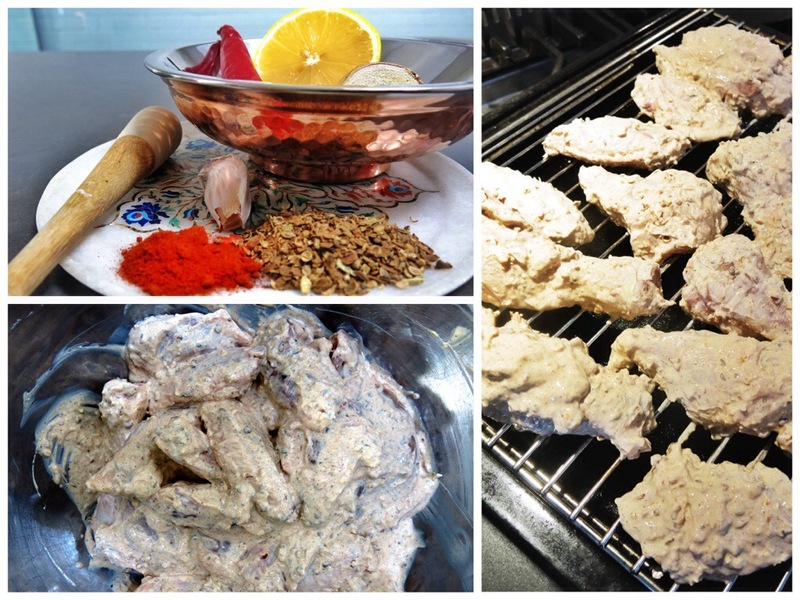 Inexplicably, it’s 12 months since I last made this fragrant marinade. Plans for an Indian themed meal to try the sweet potato vindaloo gave me good reason to make it again. It’s simply a combination of spices and aromatics added to good quality yoghurt, slathered onto your cuts of meat then left to rest for 24 hours in the fridge. Whether you choose to coat chicken portions, lamb chops, prawns (shrimp), or a whole leg of lamb is entirely up to you, but your meat after roasting or grilling will be succulent with an unctious pleasantly spiced crust. Jointed chicken wings, marinated and grilled make great finger food to serve with a beer while you watch the cricket, football or tennis too. Note to self, use this recipe more often! Heat a frypan over a medium heat and dry roast the coriander seed until well coloured. Set aside, then dry roast the cumin seed. Grind the roasted seed to a fine powder, (I use a small mortar and pestle). Finely mince the ginger, lemon zest and garlic then stir them into the yoghurt with the spices. Coat the meat in the spiced yoghurt and marinate it in the fridge for at least 8 hours or overnight before you cook it on the barbeque, under the grill or in the oven. My favourite 😀 I can’t resist a plate of Tandoori chicken! Me either, especially when made with freshly ground spices..
LOVE tandoori chicken. I have a great recipe from an Indian woman I took cooking lessons from in her home. Perhaps I need to try this one now. Ooo I’d like to see your recipe to compare! For some reason your recipes stopped appearing in my reader. I’ve unfollowed and then followed you again in hopes that that will help. 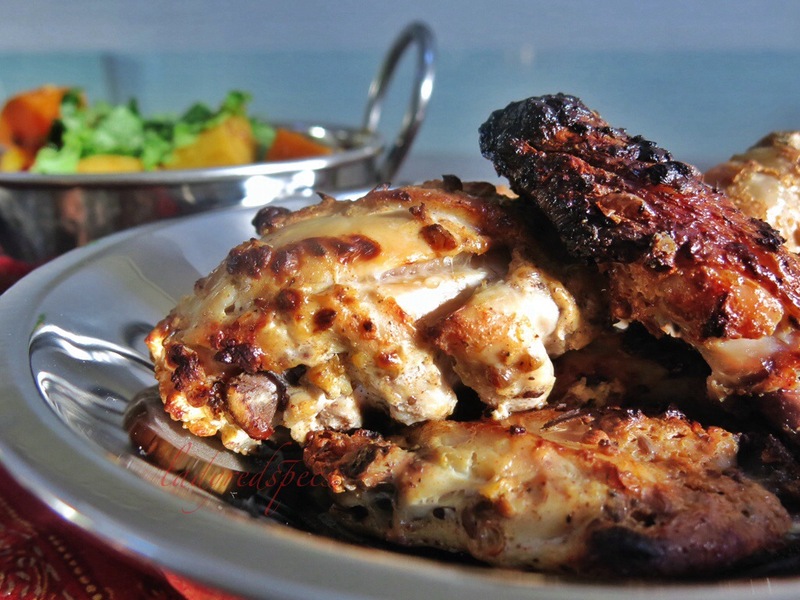 I’ve never made tandoori chicken but it looks great and I will definitely try this in summer! Love that you make the spice mix from scratch. You are not alone Stefan, but I’m glad you noticed, hopefully now you’ll get my posts. I had to reinstate some of my favourite blogs too. WP recently did a major update for devices, maybe that wiped a few settings. The tandoor marinade is delicious. if you want the traditional lurid red colour, you can add powdered beetroot. Hi Sandra, made a sous-vide version of it and it was great! The marinade gives the chicken a deep and bright flavor. Next time I won’t marinate the chicken before cooking it sous-vide, as the lemon juice had ‘cooked’ the chicken a bit more than I would have preferred (or I could skip the sous-vide part, but I tend to prefer this when cooking on a barbecue as the chicken is always done when the outside looks done). Glad you liked my version of tandoori chicken Stefan, much better than those you buy in a jar. The spices are brilliant on lamb cutlets and fish too. Yes, you need to be careful with acid in marinades, it does change the structure! I recently shot a spiced chicken dish for a food writer and, although very different from yours, her recipe also calls for marinating chicken with spices and yoghurt. So heavenly. I should try yours too! It looks remarkably appetizing! As in my thought was: please magically appear on a plate in front of me. Thanks! Ha, the instant gratification crave! We all get it! Yay to Melbourne’s weather and BBQs! I’m embarrassed to say I’ve never made my own tandoori mixture (we have a local supplier who makes a lovely one). I plan to rectify that, and have pinned your recipe to try later. My 9-year old is obsessed with tandoori chicken pizza, and I may just pass your spice recipe onto him to prepare! The flavour reward is huge for the small amount of effort with this marinade, I’d love to hear how you like it, and if the 9yr old likes it on his pizza! That chicken looks absolutely amazing… tender, juicy and seasoned to perfection! It’s been a long time since I last made tandoori chicken. I remember not being entirely satisfied with it… not sure why, maybe it was the mix of spices. I think I’ll have to give your recipe a go… it sounds like it’d be perfectly delicious! It is! The balance of spice has be be just right, and of course the spices need to be fresh to get the optimum flavour from them. This is like your local Indian tandoor guys’ chicken on steroids! My charcoal fired kettle barbeque makes a fairly good imitation! Hi Sandra. They look like they would be worth dirtying the barbecue for. This sounds wonderful! Would love to try this next time we have a barbecue meal! Do try the marinade, it’s simple and deliciously spicy. You end up with a lovely spicy crust on your meat which we love. It’s pretty simple to make, you just need to plan ahead to allow the meat to marinate. This entry was posted on January 30, 2014 by ladyredspecs in Chicken dishes, FODMAP diet, Food, Gluten Free, Indian Food, Light Savoury Dishes, Main Meals, Marinades, Spice blends and tagged barbeque, chicken, indian, marinage, spices, tandoori.